The playscape, trail, and walking labyrinth are a stage for families to experience games and activities that promote family bonding and emotional resiliency skills. Families discover their own treasures, such as joy, cooperation, compassion, perseverance, and courage. The Family Play Day program is available by advance reservation. Nonprofit partners may use the this form to share with families. Relax and get away in nature with your loved ones. This program is part of Wildrock's On Solid Ground Program dedicated to providing families with a platform to connect with nature as a path for greater health and happiness. 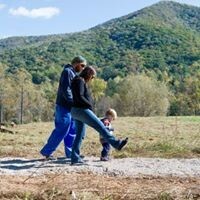 Open to any family looking to strengthen bonds and reinforce social and emotional skills, the Family Play Day is a unique opportunity to experience the benefits of nature connection. An expressive arts counselor with expertise in child development and family relationships leads the program. The Family Play Day is typically offered Saturday mornings from 10:00am to 12:00pm followed by optional extended free play until 1:30pm. The first hour focuses on a expressive art projects using natural materials and is followed by free play on the playscape. This program may be offered at other times by arrangement. Referrals from partnering nonprofits are encouraged. If you are interested in registering for a Saturday Family Play Day Program, email us here.